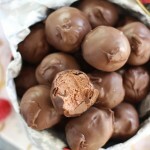 A decadent, show-stopping Valentine’s Day dessert, but one that is surprisingly easy to assemble. 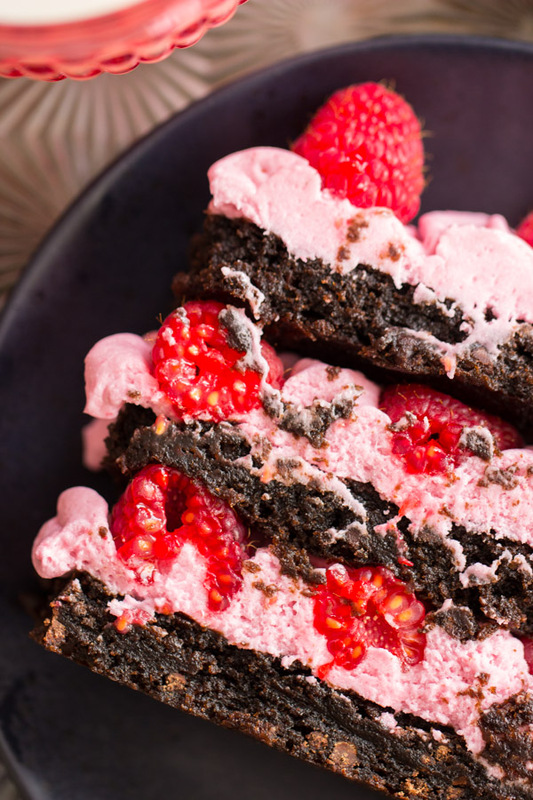 Layers of rich, fudgy brownies are filled with light, fluffy, and fruity fresh raspberry buttercream in this Raspberry Brownie Torte. I wrote a post all about the Super Bowl on Monday morning, and never hit ‘publish’ on it. The whole thing is pretty much obsolete now that the Super Bowl is old news. 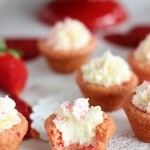 I’ve got another Valentine’s Day dessert idea for you today. I have a love affair with brownie tortes. They are showstopping desserts, but they’re actually pretty easy to make and to assemble. Your Valentine will think you labored over it, but they’re pretty damn simple for as much as they make a statement. 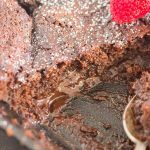 Layer after layer (okay, 3) of moist, fudgy brownies, filled with layer after layer (4!) 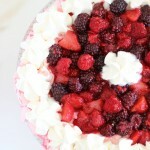 of fresh raspberry buttercream, and fresh raspberries. It’s no more work or effort than making a pan of brownies and frosting them, except that we’ll stack it high. This dessert is extravagant, and only the most lavish and decadent for your Valentine, right? 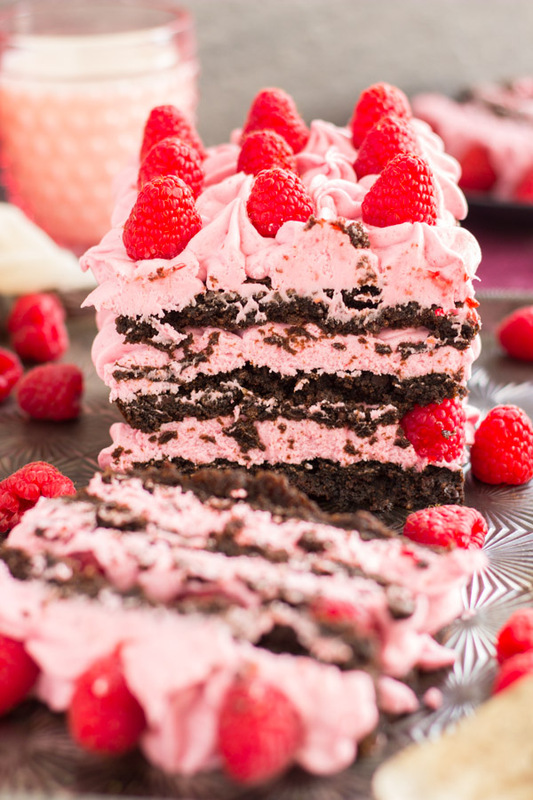 I love the pops of pink – light, soft pink raspberry buttercream frosting, and bright, vibrant pink from fresh raspberries, and the pink is broken up by layers of rich chocolate brownie. 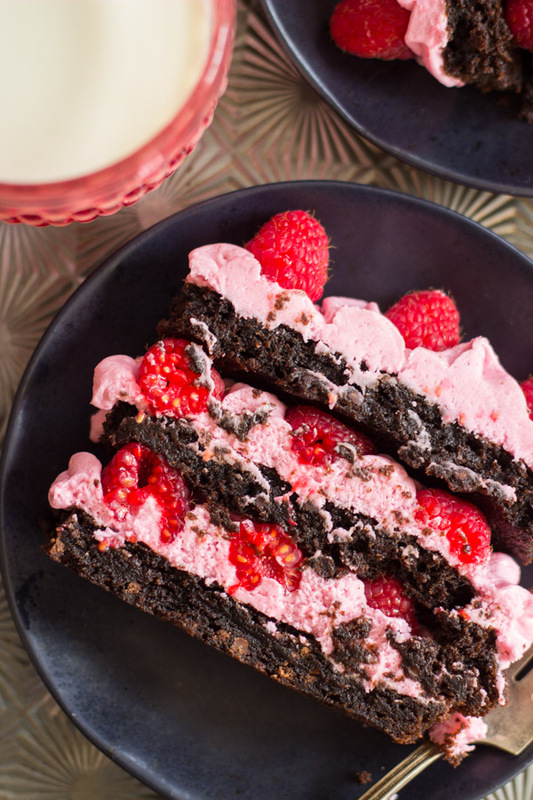 This Raspberry Brownie Torte is also a really nice variation of flavors and textures. Fudgy brownies, melty chocolate chips, and fluffy, tangy, fruity buttercream. I promise it will make for a Valentine’s Day that you and your Valentine will not soon forget. A decadent, show-stopping Valentine's Day dessert, but one that is surprisingly easy to assemble. 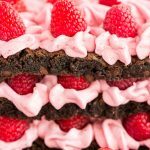 Layers of rich, fudgy brownies are filled with light, fluffy, and fruity fresh raspberry buttercream in this Raspberry Brownie Torte. 1/2 c. mini semi-sweet chocolate chips. Spread in a foil or parchment paper-lined 9x13-inch baking pan, with edges hanging over the sides of pan. Puree raspberries in a blender or food processor until smooth. If desired, push the puree through a sieve to remove seeds. Add the powdered sugar, vanilla, heavy cream, and raspberry puree. Beat until thick and fluffy, about 5 minutes. Add more powdered sugar or cream, if needed, to achieve desired consistency. To assemble torte, cut the tray of brownies horizontally into 3 large pieces. They will each be approximately 9x4 inches. On a serving platter, carefully lift out and place one of the brownie pieces. 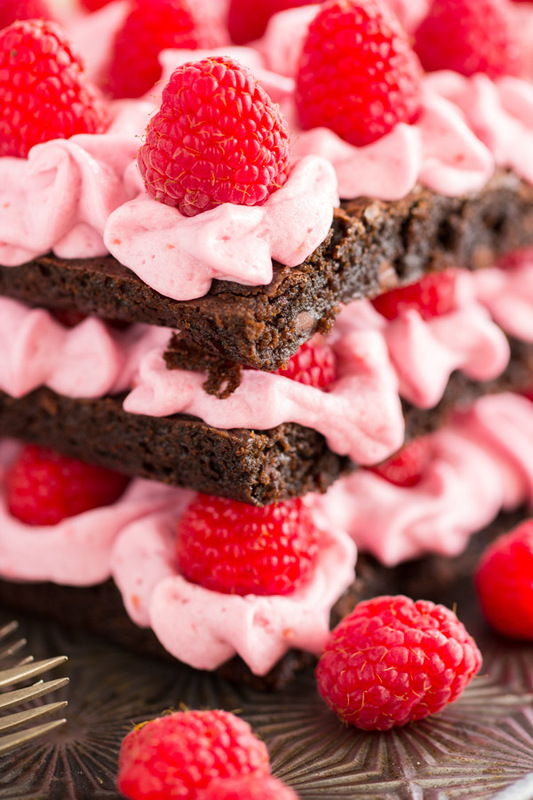 Pipe or spread 1/3 of the raspberry buttercream onto the brownie layer. 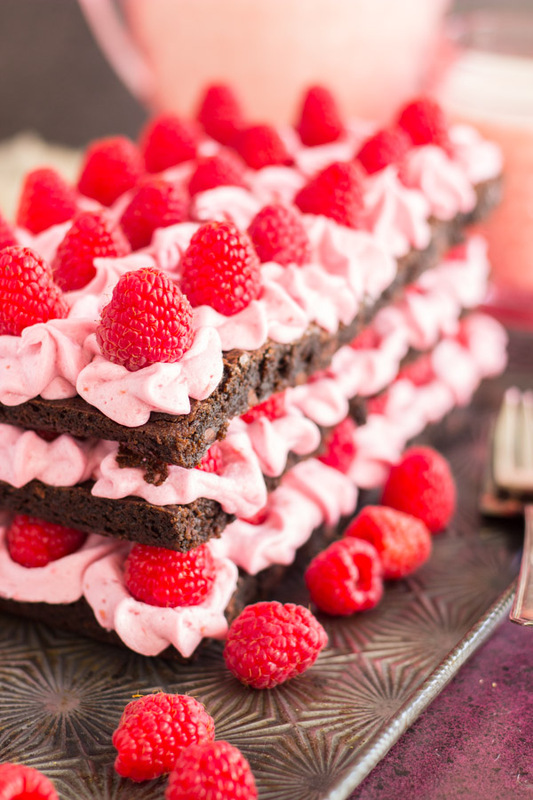 Arrange raspberries over the buttercream, pushing down into the frosting. Carefully top with a second layer of brownie. 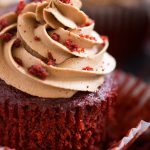 Repeat steps - spreading with raspberry buttercream and covering with raspberries. 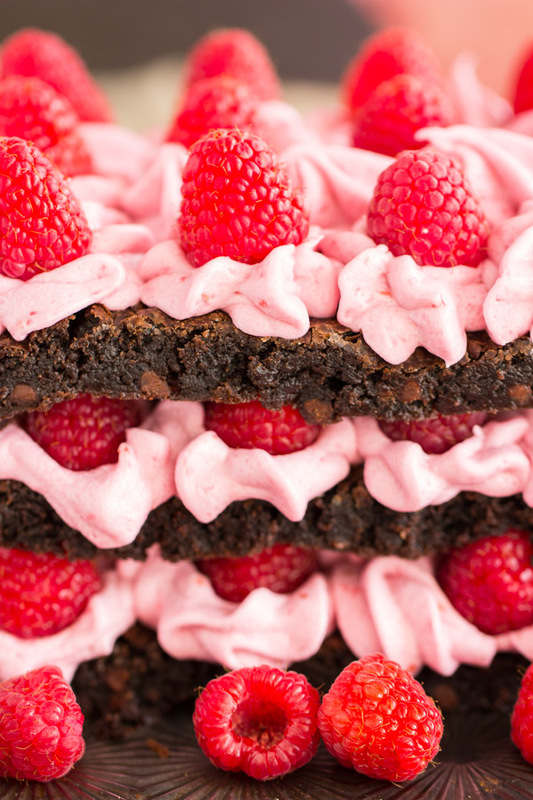 Carefully arrange the final layer of brownie, and repeat with remaining buttercream and raspberries. Refrigerate for about 1 hour to firm the torte before slicing and serving. Devour!! I’ve actually never had a brownie torte, and now I feel like I’m totally deprived and missing out. This is gorgeous, Sarah!